Our thanks goes to many descendants of James and Ellen, including Clare D'Amico for supplying many of the dates on this page and other pages. 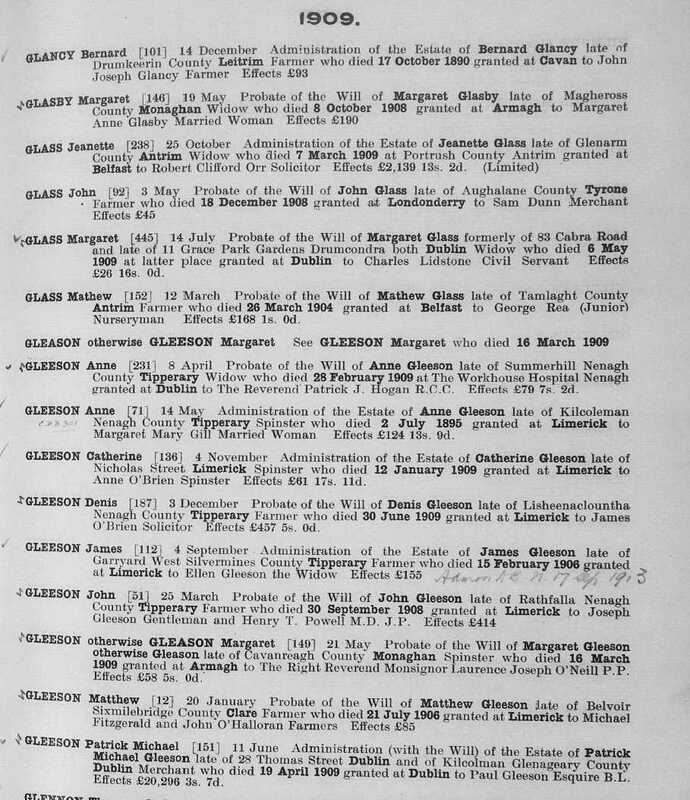 James GLEESON was baptised on 1 August 1846, the son of James GLEESON, farmer, and Mary GLEESON, probably in Garryard. This James GLEESON, farmer, is probably also James GLEESON(Oxley). Go to this page for known family members of James GLEESON(Oxley). 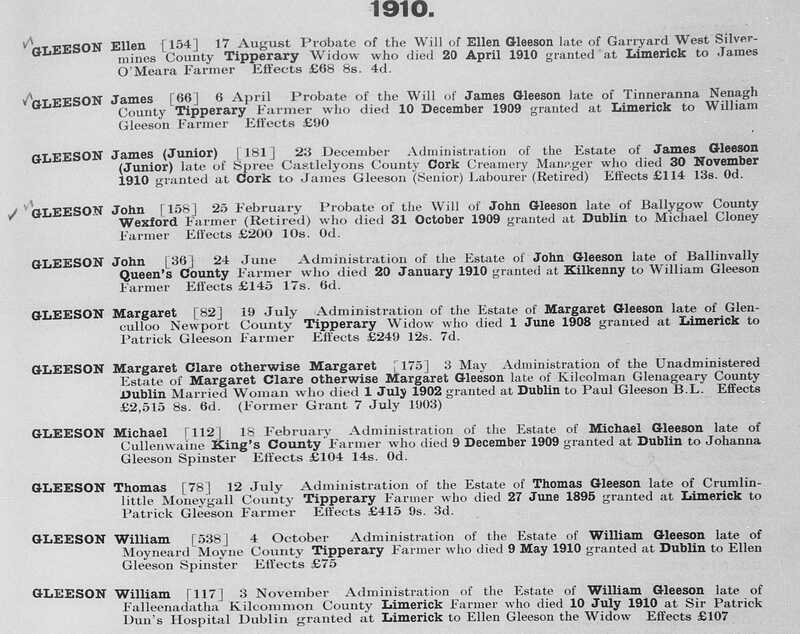 Besides son James above, "James GLEESON, farmer" must have had other children, the children of James GLEESON and Ellen HERBERT that moved to the USA had a cousin named William Francis GLEESON, born 28 October 1874 in the Silvermines area. See the William GLEESON family info at this page. 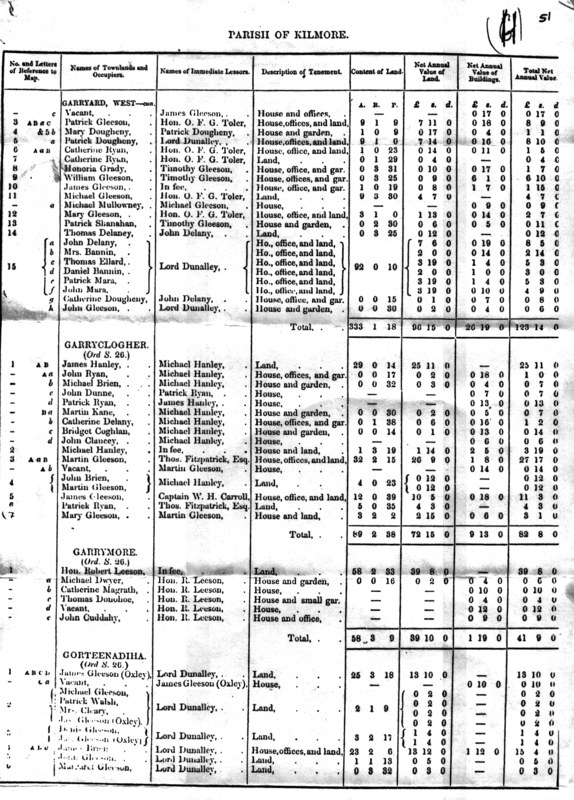 From Griffiths "Primary Valuation of Tenements" of 1840, we find multiple listings for James Gleeson in West Garryard. They could be all the same person or more than one. There is parcel 2Bb occupied by James GLEESON (Oxley) leasing a house, offices and land from Hon. O.F.G Toler. Also on the parcel are a Michael GLEESON and a Margaret RYAN leasing land only. An adjacent parcel has Denis GLEESON leasing a house, offices and land, and another small adjacent parcel is owned by James GLEESON with house and offices only, but is vacant, and another parcel is leased by a Patrick GLEESON consisting of a house, offices and land. Close by is parcel 10, owned by a James GLEESON, comprised of a house, office and garden. On adjacent parcel 9 is a William GLEESON leasing a house, office and garden from Timothy GLEESON and on parcel 11 is Michael GLEESON leasing land from Hon. O.F.G. Toler, while house is being leased by Michael Mullowney. Other GLEESONS in West Garryard are Mary GLEESON leasing from Hon O.F.G. Toler and John GLEESON leasing from Lord Dunalley. Copies of the Valuations listed above can be viewed here and here for more detailed information. Hopefully this info will be of some help in our further research. Because there were so many "Gleesons" in the area, almost all the Gleeson families had "nicknames", such as Gleeson(Whelan), Gleeson(Fira), Gleeson(Con), Gleeson(Jacks), Gleeson(Cooper), Gleeson(Oxley), etc. so they could be differentiated. Go to this page to see where some of these GLEESON families are located now. Ellen HERBERT was born between 1851 and 1855, probably in Boher, to William HERBERT, farmer. Per the Marriage record Ellen was 25 when married, and therefore born in 1855 and per the death record she was 59 and born in 1851. The denomination of both is listed as "CR". James is listed as a farmer of Garryard, while Ellen was from the town of Boher. James' father is listed as James GLESSON, Farmer. Ellen's father is listed as William HERBERT, farmer. The ceremony was performed by Wm. Lynch C.C.(Priest). They were "married by special license"
The witnesses were Patrick MARA and Bridget SLATTERY. Mary GLEESON, baptized 20 November 1880 She came to the USA and in 1903 she was living at 2139 5th Avenue, Troy, New York. Here is Mary's birth record, but they did a poor job of copying it. On 9 April 1903 her sister Margaret arrived at Ellis Island from Ireland. Margaret was heading to her sister's residence in Troy, New York. Mary later returned to Ireland and passed away there. Mary never married. Mary's sponsors at baptism were Thomas HERBERT & Mary. She is probably the Mary Gleeson who passed away in the first quarter of 1909 in the Nenagh Registration district. She was listed as 28 at the time of death. Ellen (Auntie Nell) GLEESON, baptized 10 October 1883. She married Forest Vanderleith They had one child named Forrest. Bridget (Auntie Boo) GLEESON, baptized 31 March 1885. Bridget married Dan Sullivan. Peter and Joseph GLEESON, baptized 28 June 1886. Joseph died in infancy. Peter must have died as a young child, as Sarah mentioned playing with Peter as a child. There was no mention of Joseph, other than some siblings had died at a young age. Peter and Joseph's sponsors at baptism were John GLEESON and Eliza GLEESON. Sarah (Aunt Sarah) GLEESON, baptized 6 December 1887. Sarah married Frank Floyd. James (Uncle Jim) GLEESON, baptized 16 November 1888. James married Mary Ellen LEE. Catherine GLEESON, baptized on 28 June 1891. Catherine must have died in infancy, as there was no mention of her by her siblings. 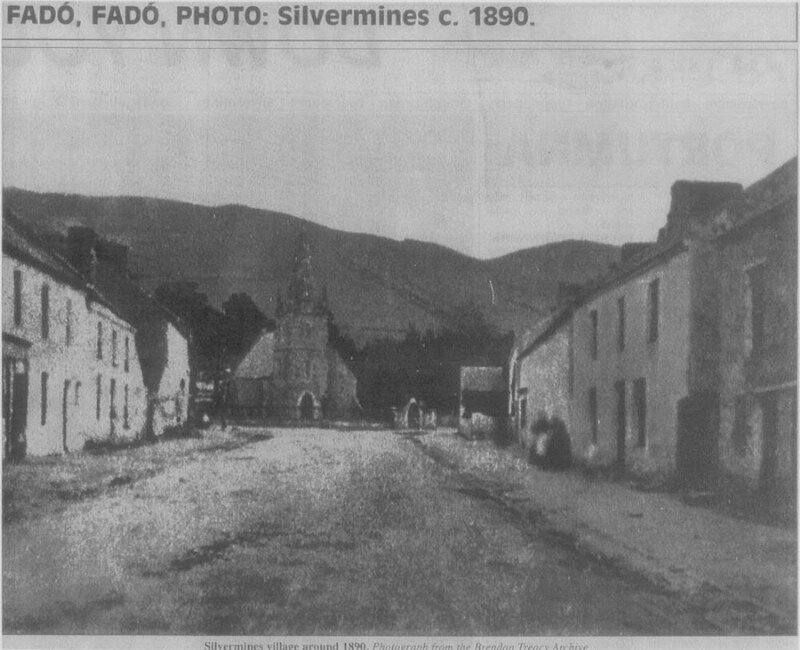 Here is a photo of the main street in Silvermines as it leads up to the church, as of 1890. Here is the same street 117 years later. The original church seen in the 1890 photo was the Church of Ireland Protestant Church, as it held the prominent position in town. The Catholic church was actually located behind and to the right hand side of the Protestant church. But the Protestant community in the area kept getting smaller and smaller, and by 1935 the Protestant church was no longer in use. After about 20 years, the Protestants offered the church to the Catholic community. The Catholics took them up on the offer and immediately tore down the church, just in case the Protestants changed their mind. By December of 1961 the Catholics had built their own church on the former location of the Protestant church. The Catholics then used their old church for a school while they were building a new school to the left of the new church. Around 1972 they tore down the old church, originally constructed in 1804. The sight of the old church is now a beautiful meditation park, with a small hedge displaying the former outline of the old church. It is maintained by the citizens of Silvermines. Click on the link at the bottom of the page to see those photos and other photos from in and around Silvermines. From the 1901 census We find the leaving in County Tipperary, North Tipperary Parlimentary Division, Poor Law Union of NenaghElectoral District of Kiolmore, in the Townland of Garryard West, . Dwelling #3. Everyone in the household is a Roman Catholic and they can all read and write, and they were all born in County Tipperary. The head of the household is James Gleeson, age 54, Farmer, married. His wife is Ellen, age 48, a Farmer's wife. Their children are: Margaret, daughter, age 18, a farmer's daughter; Ellen age 17 a farmer's daughter; Bridget, age 16, a scholar; Sarah, age 13, a scholar; James, age 12, a scholar, and Martin Ryan, age 25, an agricultural servant. From Census Form N-Enumrator's Abstract we learn all 65 residents of Garryard West are Roman Catholic, they are located in the Barony of Ormond Upper and Parish of Kilmore. From Census Form B-1-House and Buildings Return we learn the walls of the house of made of stone, brick or concrete, the roof is made of thatch, wood, or other perishable material, the home has 2, 3 or 4 rooms, and it has 3 windows on the front of the house. Based on a numerical criteria, the home is rated as 2nd class. Of the eleven homes in Garryard West, one is rated as 1st class, nine are rated as 2nd class and one is rated as 3rd class. The home has 3 rooms, their are 8 occupants, the head of household is James Gleeson and the Landowner is James Gleeson. From Census Form B-2-return of Out-Offices and Farm-steadings we learn the parcel also has one stable, one cow house and one piggery. The census was completed on 17 April 1901. The eldest daughter, Mary, has already left the home. Has she arrived in the USA? Other Gleeson families in Garryard West in 1901 are Michael Gleeson, dwelling #1, John Gleeson dwelling #2, Mortimer Glesson dwelling #4, ad Denis Gleeson dwelling #9. So 5 of the eleven dwellings are Gleeson household. On 20 April 1910 Ellen Gleeson, widow of James Gleeson, passed away. At this link is the summary of the probate of Ellen's will, late of Garryard West, Silvermines. which was completed on 17 August 1910. Her effects, valued at 68 pounds and change, were awarded to James O'Meara, farmer. Why were her effected awarded to a James O'Meara? The date of completion of the probate if the will was about 3 weeks before her 4 children left for the USA. Had Ellen accumulated debts? Had James O'Meara given the children money to pay for passage to the USA? Is James a cousin, or possibly the husband of one of James Gleeson or Ellen Herbert Gleeson's sisters? Except for the children that died at a young age, all the children of James GLEESON and Ellen HERBERT except possibly Mary, moved to San Francisco, from Ireland. In 1910 Ellen travelled from San Francisco back to Silvermines and gathered up the last of the family. 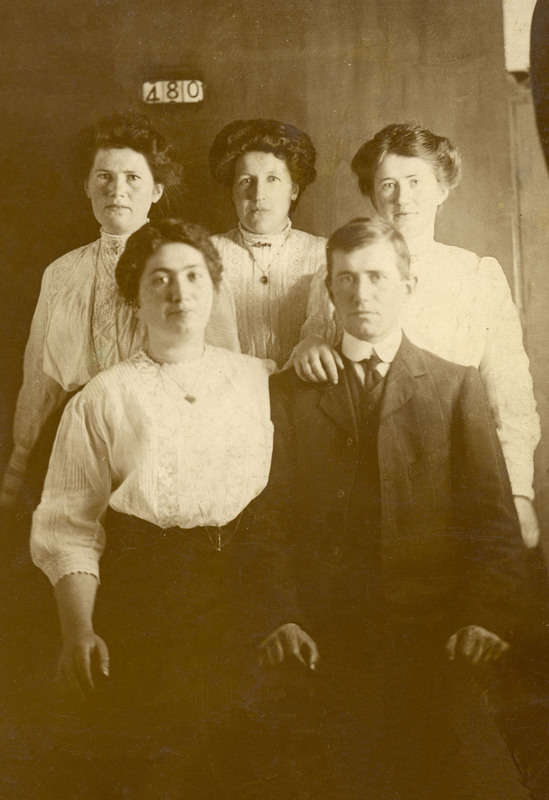 Then on 11 September 1910 Ellen, Bridget, Sarah and James departed Ireland for the last time, never to return. They boarded the White Star Line ship the "Arabic" in Queenstown, Cork, bound for New York. 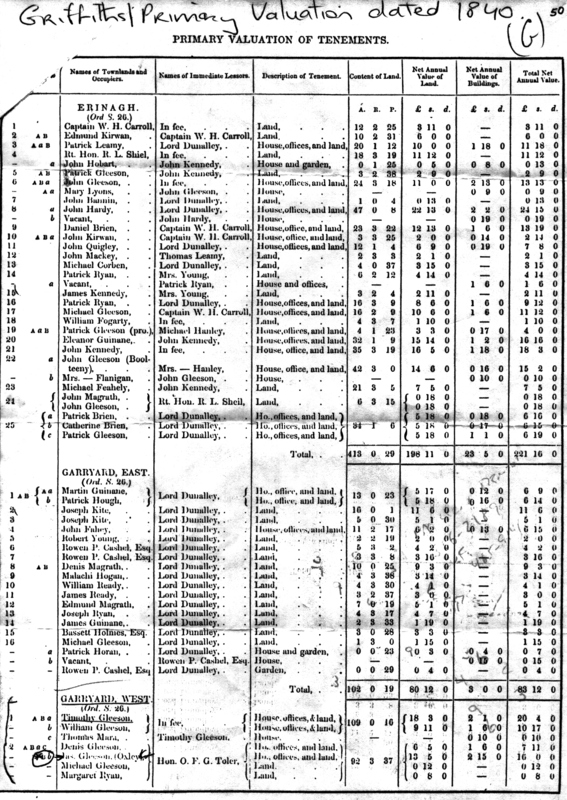 On the ship's manifest there is a section "Names and Descriptions of BRITISH Passengers." 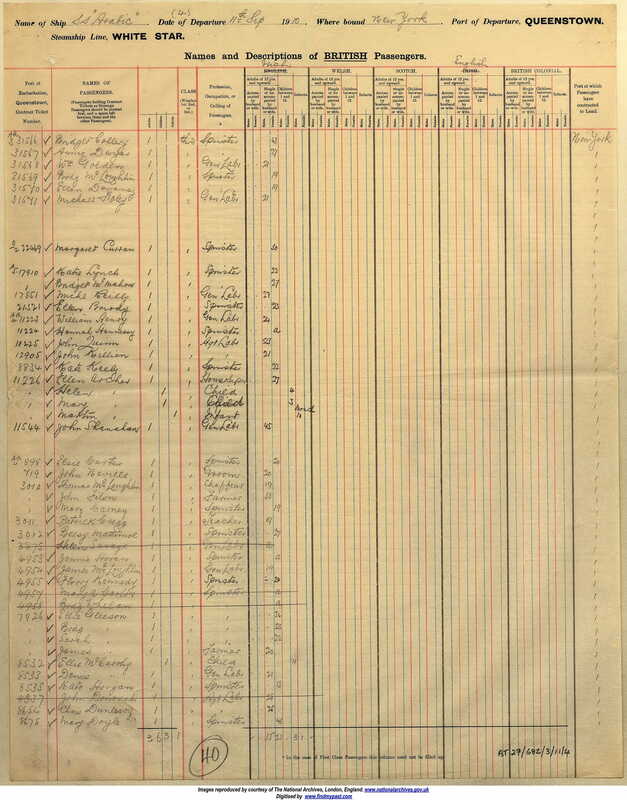 We find them under the Irish column, travelling on ticket number 7926, as follows: Ellie Gleeson, spinster, 26, Brdg Gleeson, spinster, 23, Sarah Gleeson, spinster, 22 and James Gleeson, farmer, 20. They are travelling in 3rd class. Go here to view a copy of the ship's manifest. Here is the history of the SS Arabic, which was sunk by the Germans at the beginning of World War I. The four of them arrived at Ellis Island, New York eight days later on 19 September 1910. Amazingly, sister Ellie lost 2 years on the eight day voyage, as she was now listed as 24 years old!!!. The other three were still the same age. We also find the name of the nearest relative in Ireland. It looks like it reads James O'Meara ????? from Nenagh, County Tipperary, and that their future permanent residence is San Francisco, California. On the second page of the manifest we learn they are going their sister Margaret's location of 31 Commonwealth Ave., San Francisco. 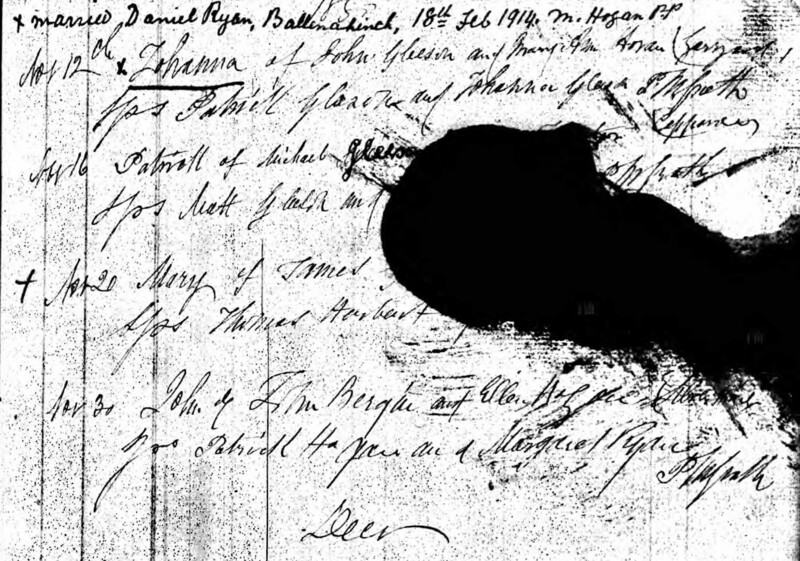 The address of a Mrs. Ryan. They all have fair skin, blue eyes and born in Tipperary. Ellie is 5' 9", Bridget is 5' 7", Sarah is 5' 4" and James is 5' 10" tall. The address of 31 Commonwealth Ave, San Francisco is the same address Auntie Nell gave at Ellis Island when she first came to the USA in 1908. All of the above GLEESON'S probably decided to come to the San Francisco because their cousin William GLEESON arrived in the USA in 1891 eventually made his way to San Francisco. Visit William GLEESON family info. Eventually we hope to discover his parents and the common grandparents for these two families. This William GLEESON is undoubtedly also a descendant of "James GLEESON, farmer" listed at the top of the page. Here is a small photo of the 5 GLEESON children that came to San Francisco. Here is a larger version of the same photo. Left to right in the back row are Bridget, Margaret and Sarah. Nell and James are in the front row. 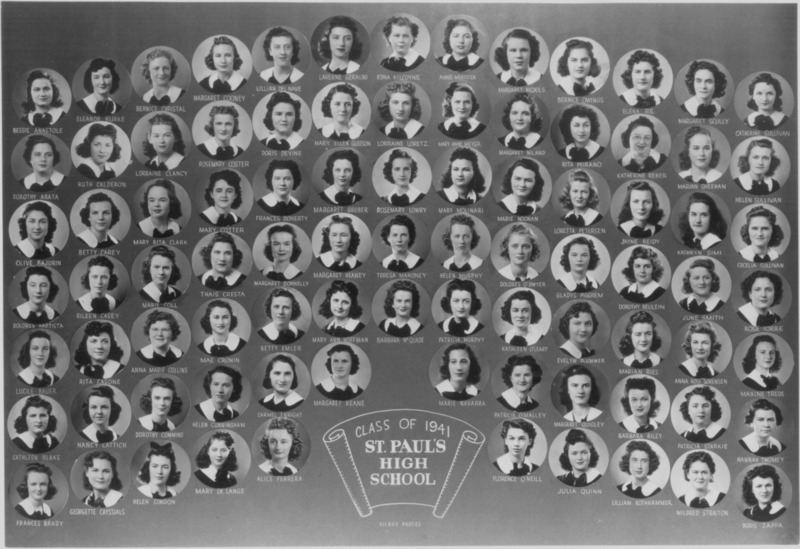 Here is a photo from St Paul's High School class of 1941 which includes 3 grandchildren of this couple, Mary Ellen Gleeson, Helen Sullivan and Cecelia Sullivan. The 3 girls were all part of a group called "The Muses." There were 8 of the 9 muses were in the high school photo. 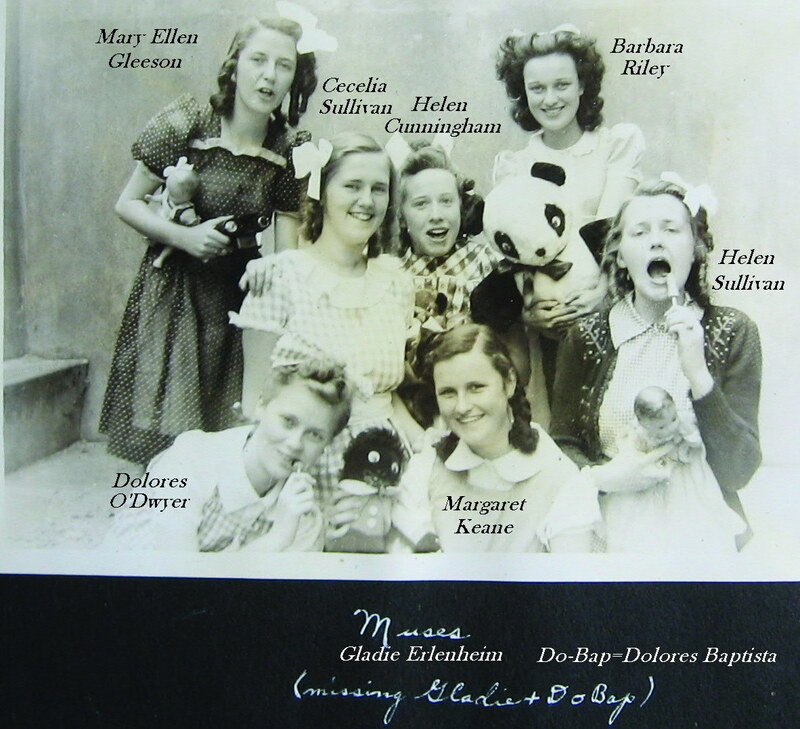 The other 5 are Dolores (DoBap) Baptista, Helen Cunningham, Margaret Keane, Dolores O'Dwyer and Barbara Riley. The ninth muse was Gladie Erlenheim. Here is the same Muses photo with names included. Click on the next link to learn what happened to these best of friends, the Muses!!! Go to this page to see the sights in and around Silvermines, including pictures of what was probably the James Gleeson family home, now in ruins.